For our civic leadership workshop this week, we made our way to Southern California Edison, Westminster. Our morning began with a panel discussing education issues in Southern California. The panel featured Mary Anne Foo, the executive director of OCAPICA; Kurt Ikeda, fellow in the Office of LAUSD Board President Dr. Ref Rodriguez; and Jazmin Ortega, Southern California Liaison for State Superintendent of Public Instruction Torlakson in the California Department of Education. All three members of this panel shared their experiences in education from Kurt’s time as a teacher in a charter school to Mary Anne giving us more insight into the various programs OCAPICA offers to students and their families. Over the course of the panel, there was a running theme of thinking about the whole person beyond the academics. The speakers all spoke on how stereotypes hurt the Asian American community because it perpetuates the lack of awareness of mental health issues and even the lack of resources for these students living in poverty. Education does not only include how many AP’s someone is taking, but also encompasses mental and physical well-being, job skills, and mentoring. With this in mind, it is important when deciding on policies, programs, and funding, that the needs of the whole person and the whole family is considered or [the entirety of the issue] is not addressed. Kurt told us, “Education is a political act.” The policies implemented and what is taught in school effects the narrative created around our communities. Growing up, this lack of representation in both the media and education definitely contributed to the confusion I had about my identity as an Asian American. Early in the Leadership Academy, I had a discussion with one of the CAUSE staff members about how important it is to introduce more diverse history early on and from the actual perspective of these minority groups. Jazmin discussed how this type of dialogue is critical to being able to change narratives because there are so many commonalities between groups that are not being represented. When we start these conversations, we are better able to come together. Who we have in leadership matters because that representation of our stories and of our experiences matter. 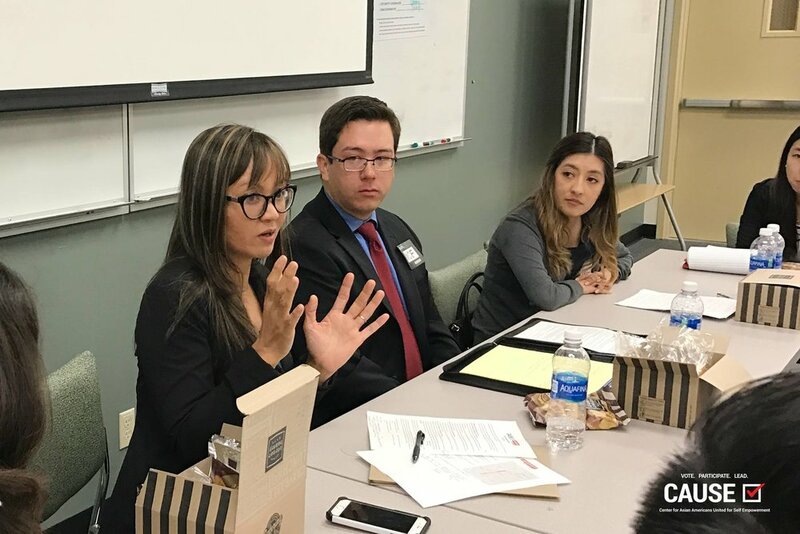 For the second portion of our day, CAUSE board member Tammy Tran of Southern California Edison hosted a luncheon to discuss working with leaders from both sides. 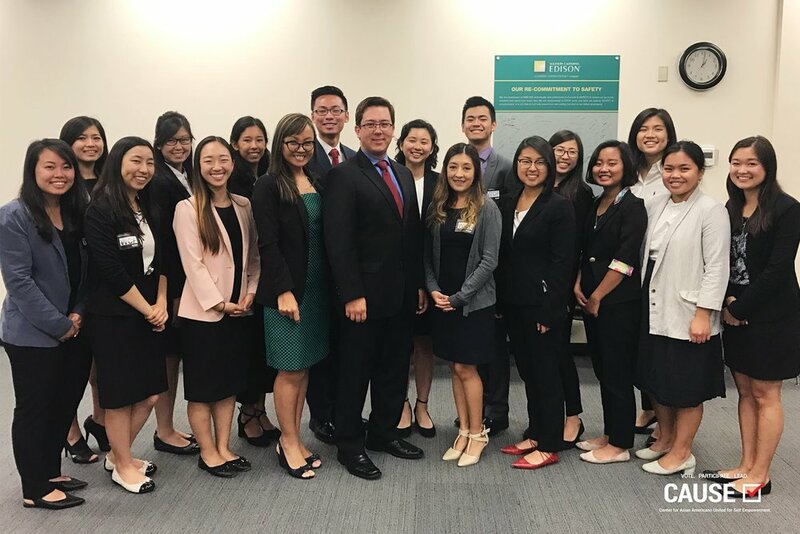 She welcomed Councilmember Kim Nguyen of Garden Grove and Councilmember Jeremy Yamaguchi of Placentia to share their experiences as young council members. They also shared how they have worked with people who do not necessarily share their same views. Both councilmembers left us with the advice to find people whom we can work with, even if we do not agree with them completely. Simply listening to what the other person says does not mean you have to agree with their opinion, but rather it can open up the discussion to be expanded on and gives both parties the opportunity to learn about a new perspective. We ended our day by heading back to the CAUSE office for a professional development workshop on public speaking. But rather than talking about eye contact or voice projection, this workshop led by CAUSE’s Director of Programs, Lindsey Horowitz, emphasized the power of storytelling. We listened to a Ted Talk presentation about a woman’s journey to becoming an advocate for her community and through it found pieces of familiarity to our own lives. Lindsey then went on to ask us to tell a story that has impacted us about our family, our identity, our motivations and so forth. From there, Lindsey asked us why we wanted to share that specific moment, what was significant about it and how we believed it would impact others. Over the past seven weeks, our cohort has become so close and I felt like that was truly evident in how open everyone was about their experiences. As we continue to get to know each other, more and more dimensions are added to the complex, [and I can really see all the dimensions that] have made them into the amazing people they all are.